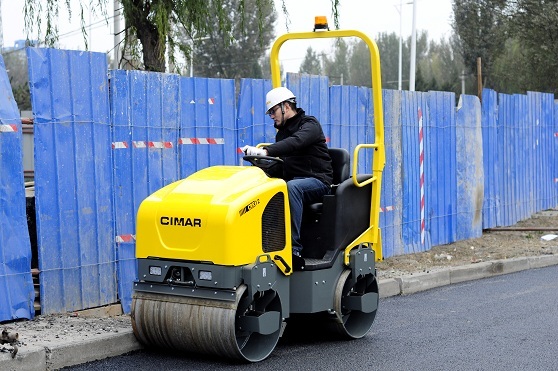 CIMAR CRR-12 one-ton roller series features dual drum drive and articulated steering for extremely accurate control. Front drum vibration with static rear drum leaves a quality asphalt finish. 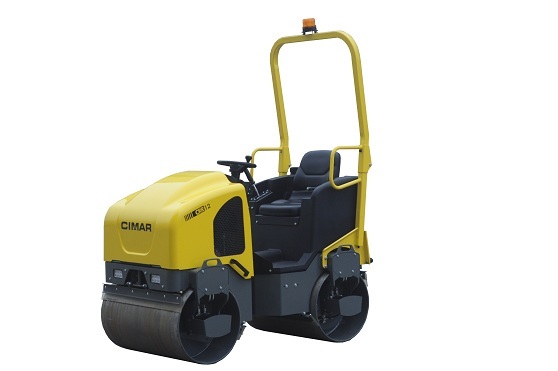 Outstanding overall roller performance and a high exciter frequency allow compaction at faster speeds while still delivering even coverage and excellent results. 1. Easily maneuverable units provide flush compaction to curbs and obstructions. 2. Pressurized water system offers consistent water flow. An eight position timer allows the operator to adjust water flow to match conditions. 3. Rear platform and front hood tilt up for easy access and improve machine serviceability. 4. Rollers offer reduced sound levels; units run quieter than competitive machines in the same class. 5. Ideally suited for compaction of granular base surfaces and finish layers on road repairs, driveways, parking lots and any asphalt surface.